Remember how thick smartphones used to be? Just the other day, we showed you leaked photographs of the Huawei Ascend P7. The handset is just 6.18mm thick. As we noted previously, the Apple iPhone 5s, a pretty thin handset in its own right, weighs in at 7.6mm thin. But there was a time, not so long ago, when some handsets were as thick as the proverbial brick. Take a look at this commercial from 2010 for the Sony Ericsson Xperia X10 mini. Sure, it's a cute ad, but take a look at how thick the device is. If you're curious, the measurement of the phone was 16mm thick. As you would imagine, the rest of the specs seem like they are a century old. Remember that the full-size Sony Ericsson Xperia X10 had a 4 inch screen, which is even smaller than today's "mini" smartphones. The Xperia X10 mini carried a 2.5 inch screen with resolution of 240 x 320. Under the hood was a single-core 600MHz Snapdragon S1 CPU with the Adreno 200 GPU handling graphics. A 5MP camera was on back and there was a 16GB microSD slot available. We've come a long way in just four short years, especially Sony. The Sony Xperia Z1 Compact is now considered the gold standard of "mini" phones with flagship-type specs. That model features a 4.3 inch screen with resolution of 720 x 1280 and is powered by a quad-core Snapdragon 800 CPU. A 20.7MP snapper adorns the back with a 2MP camera on the front. You can check out the extremely thick Sony Ericsson Xperia X10 mini, starring in a rather cool commercial, by clicking on the videos below. Well yea, but some of those phones felt good in the hand because of that thickness (not in the pocket though). Now they've gone the exact opposite direction making it so thin that ergonomics take a serious hit. I think the Moto X had it just right with going for feel rather than pointless numbers when it came to ergonomics. Yeah...you would like that thickness in your hand. Haha. yeah moto X IMO has the best ergonomics on a phone. My dad has xperia mini pro white. It was little cute. i still own an xperia mini 2011. The exact same thing i thought when i got my Xperia X10, my first flagship device the 4" screen looked enormous coming from a 3.2 inch phone. We are laughing on these phones now . But in 2009/2010 they were high end dream phones . We are proud of our latest Apple iPhone 5s or Samsung S5 . But maybe in 2020 we will laugh on them and there specs. Technology is moving like light . x10mini wasnt high-end.. but yea i get the point. It's so thick that it can have another screen on the side. 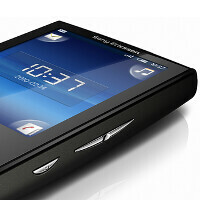 I had the full sized SE Xperia X10, it was my 1st Android, got it in 2010, gorgeous thing. I remember thinking that its 4inch display was more than enough... Here I am typing on a GS4 with 5inch, while waiting for Note 4 to arrive with an even bigger display. I have the Samsung Omnia HD from 2009 and its still in perfect condition. It measures 123 x 58 x 12.9 mm (4.84 x 2.28 x 0.51 in) Weight 148 g . 3.7 inches screen. It still feels great in my hand. Its pretty useless compared to my Galaxy S3 and S5, but it took some impressive macro shots. Sony like the thick phone with the huge bezel and non replaceable battery. That is why the Samsung and the iPhone is the best. The iPhone can only get away with the non replaceable battery because it is the Apple. "The iPhone can only get away with the non replaceable battery because it is the Apple." Warning... warning...'iDouche' detected. x1 mini pro is even thicker with physical qwerty keyboard. LOL. Anyone remember the HTC TyTn? I actually asked my parents to buy me one (the phone already was old) and they got me an HD2 instead. OMG I thought that phone was huge!